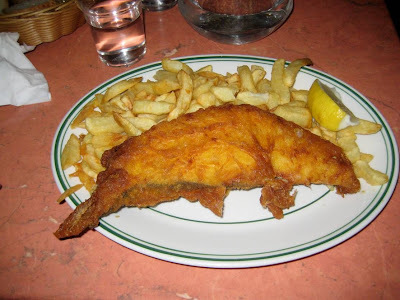 It's a cliché, and one you will hear often repeated by Northern expats around these parts, that you can't get a decent Fish and Chips in London. Of course, given that deep fried fish and chipped potatoes is hardly the most complex takeaway food, there are plenty of places in London that do a pretty passable F&C, and equally, like anywhere else in the country there are far, far more that do a terrible one. Given that, in the interests of my pocket and my pulmonary artery, I'm not about to try every chippy I come across in the capital just in case it turns out to be good, I did a bit of research and last Saturday turned up at Masters Superfish in Waterloo at the very 'Northern Chippy' time of 5:30pm. 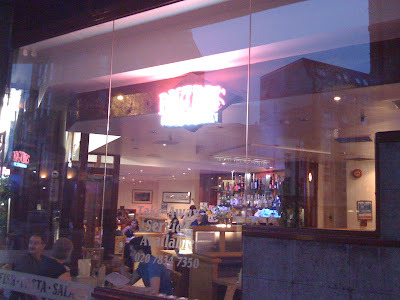 Considered one of the few "real" chippies in the capital (along with The Golden Hind in Marylebone and Seafresh in Victoria, amongst others), Masters has built up quite a reputation amongst foodies and bloggers and I was quite excited to see what the fuss was about. First impressions of the room were pleasingly authentic - plain, no-nonsense décor with a little takeaway hatch on the way in and - delightfully - like any good Northern chippy a wall containing fading pictures of faded light entertainment stars who have popped in for a photo opportunity over the years. 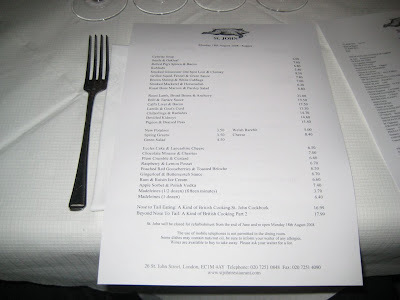 The menu was slightly more extensive than I was used to up north, with more premium options such as Dover Sole and Halibut alongside the traditional Cod and Haddock fillets. We all went for fish and chips. 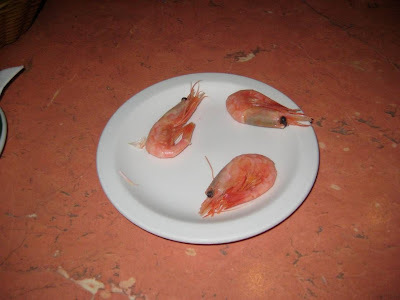 First up was served a free plate of prawns each, which were sweet and tasty but some of our party were put off by the orange eggs - it must be the time of year. Also dished up extra were some lovely tasty pickles: a large white onion and a sweet gherkin, top marks again for those. Fortunately, the Main Event, when it arrived, didn't disappoint either. 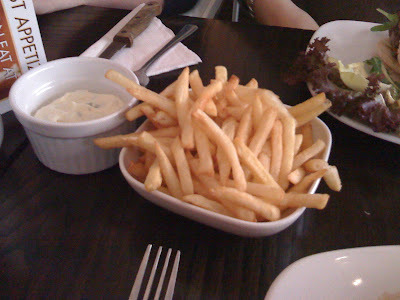 Lovely crunchy chips in all sorts of sizes, and a healthy slab of flaky white fish covered in a dark, dense batter. If I'm going to be picky, the fish was probably slightly overcooked - the extra crunchy batter wasn't to everyone's tastes, and the fish was just a smidgen on the dry side - but these were minor quibbles and I'd be lying if I said I didn't enjoy my plate of food. I'd be happy to call Masters Superfish my local chippy, and once you add in the London markup it wasn't too expensive either. It's understandably popular, and although our fellow diners in the early evening consisted of an elderly couple and a table of Japanese tourists timidly extracting their fish from its batter and eating it separately, I am told the queue can stretch out of the door. 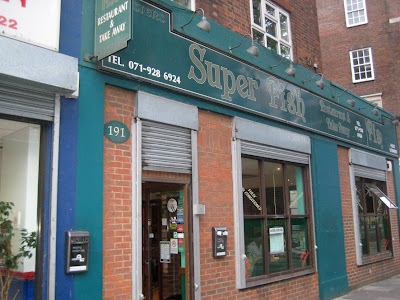 In an area of London becoming famous for its varied and excellent dining options (The Anchor and Hope, Meson Don Felipe), Masters can hold its head high. I'll certainly be back. I always thought it was strange you didn't see more Busabas around town; given that every time a new one opens the queue to get in stretches around the block there was clearly enough pent-up demand. Now the inevitable has happened and Busaba is Going Nationwide, but more on that later. 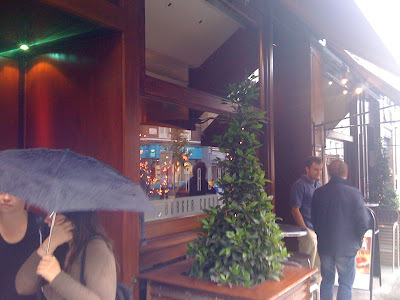 I've already said I'm a big fan of Busaba Wardour Street, which if you can get there at some odd time like 3:30pm or 11am, it's possible to get in and get a table without too much trouble. 7:30 on a Friday night you can forget it, obviously, but which idiot wanders into Soho at 7:30 on a Friday night and expects to get a table somewhere decent without a reservation? But this post isn't about Busaba Wardour Street - last Saturday I visited the Bird Street branch, tucked around the back of Selfridges. The queue, predictably, was offputting, but it's a much bigger space than the Soho joint and so we found ourselves seated within about ten minutes - not bad. Between the 5 of us we had a selection of small dishes from the sensibly pitched menu - chicken wings and tamarind sauce (really lovely actually), Prawn pomelo (an old favourite, served on edible green leaves for the novelty factor), crispy Thai calamari and a bowl of gorgeous Mussaman duck curry - still my favourite item after all these years. Service was brisk and friendly, and even the odd seating arrangements didn't seem to rankle as much this time, perhaps because there were enough of us to fit on two sides of a table and we could all hear the conversation - past experiences haven't been so social. It all went down very well of course, and along with a little jug of hot sake the bill came to around £18. There's very little to moan about at Busaba - it's competent, fresh cooking delivered with flair and - the Holy Grail of chains - the standards don't seem to vary between branches. I am aware that this post may simply be preaching to the converted - if you live in London you've probably been many times already. If you don't live here, however, you won't have to wait too long - around 30 branches are set for rollout across the UK in the next five years. Go soon, before the sheen wears off and it just becomes another Wagamamas. Halfway through my starter of Rolled Pig's Spleen at St. John, and who should wander in but Fergus Henderson himself. Looking healthy and happy with his trademark inch-thick pebble glasses, he soon settled into a corner table with a few friends and held court while a succession of people congratulated him (I assume - I wasn't close enough to eavesdrop) on the newly refurbished restaurant. At the bar was gastronomic superstar Mark Hix, who I didn't see eating anything but his presence alone was presumably enough of a blessing. And during the course of the evening I think I spotted Fay Maschler amongst a healthy smattering of food critics and food lovers. 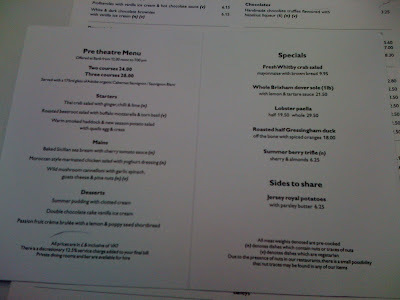 St. John, where the British food revolution started, is as much a pilgrimage as a meal out for true foodies, and although not exactly hushed in the echoey whitewashed warehouse room, there was certainly a good deal of reverence from what I could tell of the other tables. And yet. As if I haven't been in this situation enough before to learn, it's really never a good idea to build up somewhere too much, as you can only be disappointed by the reality. St. John, restaurant to the stars and voted an incredible (literally) #16 in the Restaurant Magazine top 50 restaurant list 2008 (above L'Arpege and Alaine Ducasse at the Plaza Athénée!) 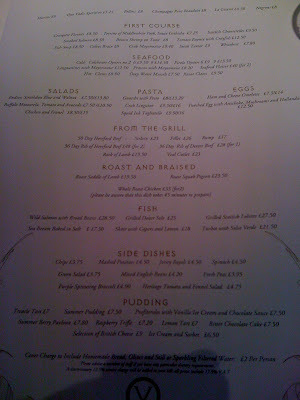 served me a perfectly pleasant meal which wouldn't have been out of place in any half-decent gastropub in the capital. But #16 best restaurant in the world? The mind boggles. Back to my meal, then. Now I've never had rolled pig's spleen before (shocking, but true) so I have no way of knowing if this is better or worse than your average rolled pig's spleen. 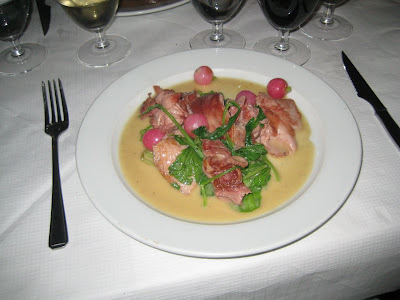 But although the bacon was clearly of high quality, the offal was tasteless albeit with a pleasant texture. I wasn't sure what to do with the accompanying little pot of vinegar, as when it was paired with the meat it completely overpowered it, and on its own was just odd. Pickels were decent and sliced onion was just that. So far so ho hum. 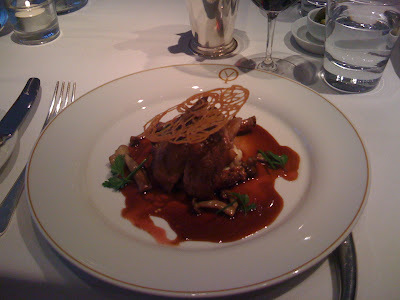 My main course, fortunately, was much nicer. 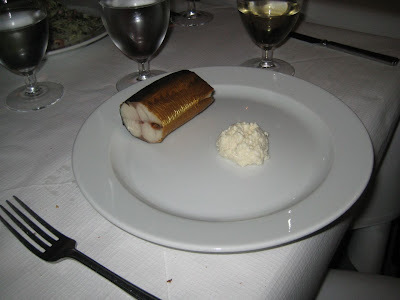 Chitterlings (pig's intestine, in case you were wondering) were rich and salty and resembled pleasantly boiled bacon. With them were little boiled radishes, which were a bugger to spear on my fork but had a lovely subtle flavour. 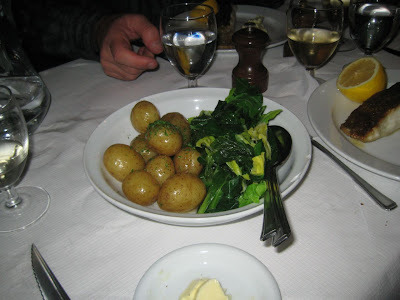 Around the table we variously had a pretty standard smoked mackerel, fresh if hardly mind-blowing Brill steak, and a good liver and bacon. 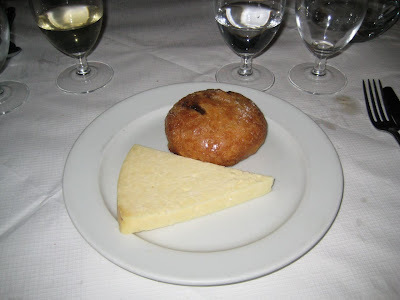 My dessert was "Eccles cake and Lancashire cheese". An unlikely combination, you might think, but it worked surprisingly well - the cheese wouldn't have stood out served in a cheesecourse, but its bland creaminess went nicely with the sweet raisins and pastry. And I suppose none of it was cynically priced and service was good. 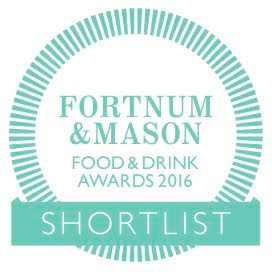 But unless there's something crucial that I'm missing, this is just a good gastropub, this is not a world-beating restaurant. Credit where credit's due to Henderson for cooking up parts of a pig which must cost next to nothing in wholesale and turning them into something people are prepared to pay for. But after the novelty of eating Sheep's Appendix has worn off, the elephant in the room remains - people don't often eat offal, because it usually doesn't taste very good. The supremely ironic thing about my experience at St. John was the similarities with another restaurant that has forged a brave new gastronomic path recently. 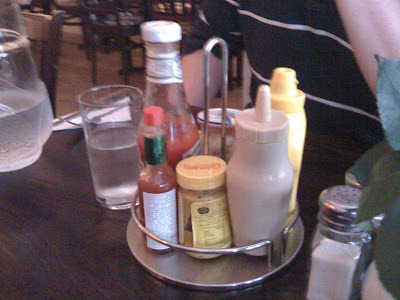 Constraining themselves to use only ingredients from an oft-neglected and inexpensive source, serving competently cooked dishes in attractive surroundings and charging premium prices, and most importantly trading on the novelty of the sourcing of said ingredients and the environmental benefits thereof, St. John has a natural sister restaurant - Saf. 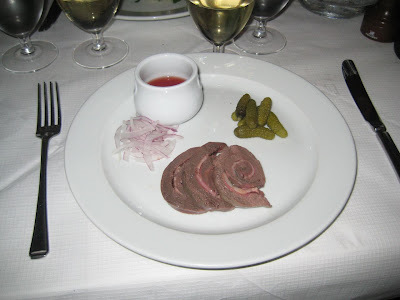 True, one is purely vegan and one uses offal, but I believe the connections are too strong to ignore when you consider the Raw Food Revolution is supposed to be the next big thing after nose-to-tail eating was ten years ago. 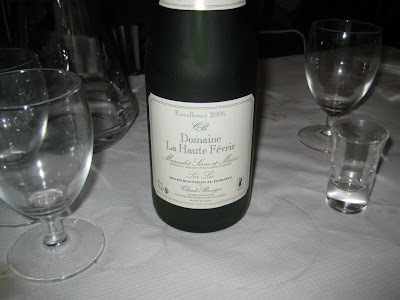 Despite the glamorous surroundings and star factor, I was left distinctly underwhelmed after the bill (£50 each since you ask) was paid and the last dregs of a rather nice Muscadet sur Lie were drained from the bottle. The best thing I can say about St. John is that you are likely to try unusual and interesting cuts of meat that you will not find anywhere else in the country, and you will have them cooked well and served with a smile. The worst thing I can say about St. John is that, most probably, you won't want to try them again. My latest discovery and obsession is the Whitecross Street food market, easily walkable from the office on Thursday and Friday lunchtimes, just the other side of Bonhill Fields cemetery in Shoreditch. 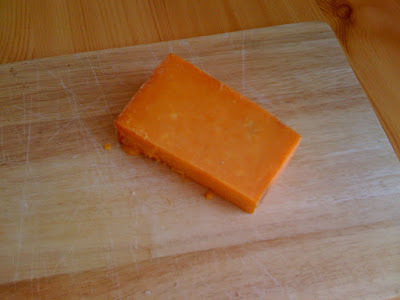 I will probably do a separate review of the wonderful burritos, the heavenly roast hog and apple sauce sandwich and the exciting Thai and Indian curries at some point in the near future, but this post is about a cheese I picked up from the Neal's Yard stand on Whitecross Street last week - Sparkenhoe Red Leicester. Sparkenhoe is, according to their website, the only Red Leicester cheese to still actually be made in Leicester, except this product is a modern revival of an old recipe that was last made in 1875. It uses - hooray - unpasturised cow's milk, which gives it that unmistakeable earthy, farmy note and from the first bite you are already a world away from the bland, chemically coloured Red Leicester of the supermarkets (although you can, apparently, get it in Waitrose). I also should specifically mention the flavour of the rind - an extraordinary woody, complex taste that matched the saltiness of the flesh incredibly well and contributed to the individual character of the cheese. 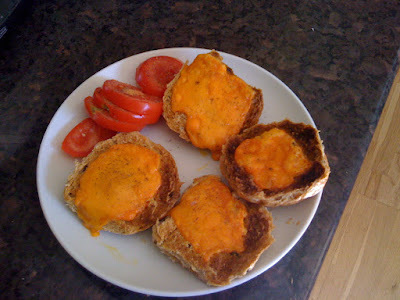 Melted and bubbling on brown bread, the farmy flavours really shone through, and it made a pretty decent cheese toastie, even if at £5 for a small block I was in no danger of making this a regular snack. However, if you ever spot it in your local cheese shop, or if you're lucky enough to have a Waitrose nearby, I strongly suggest you pick up a sample yourself. 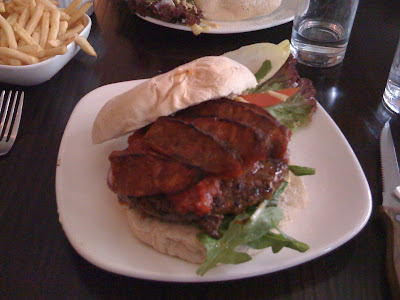 Ben and Howard over at Food and Drink in London are on an on-going quest to find the best burger in London. 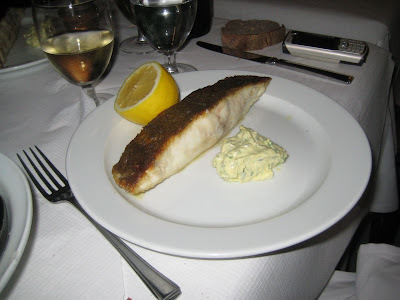 Diligently and objectively they rate each example from outlets as varied as Ed's Diner and Joe Allen, but still their favourite is that served at Haché in Camden - it gets 14/15, which I'm guessing is pretty hard to top. Well, I'm not as diligent or objective as the Food and Drink in London boys, and I'm not going to waste my time traipsing around London eating mediocre burgers when all the hard work has been done for me. 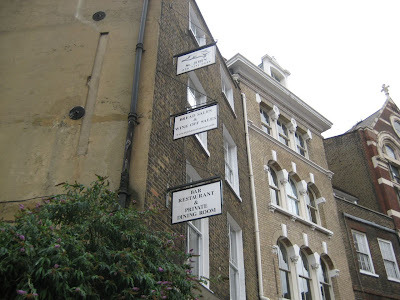 So on Saturday afternoon, dodging the pouring rain, I walked over Albert Bridge to Haché in Chelsea, the second outlet in the capital after the wildly popular Camden branch. I have often railed against restaurants that try to be all things to all people, and end up being nothing to anyone. 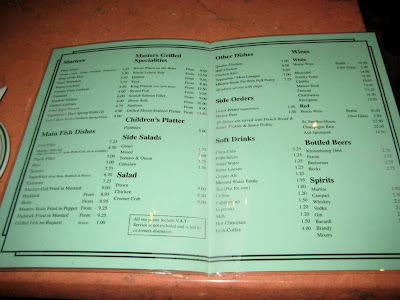 You can spot them a mile off, with their huge yet strangely timid menus, dishes plucked seemingly at random from all corners of the globe with nothing connecting them except a total and spectacular failure in execution. And here, delightfully, at the other end of that scale is Haché, unapologetically selling nothing but burgers and burger accessories. A hundred different types of burgers, sure, made out of anything from venison to lamb to tuna (oh and beef as well of course), but still recognisable as burgers, tasty thick patties inside a toasted bun. The beef itself was rich and flavoursome and cooked perfectly medium-rare. The chorizo added a lovely crispy layer, and although I could have done with a bit more of a chilli hit this was quickly rectified by dropping in a couple of the tiny red birds-eye chillies that came with a halloumi side. There's absolutely nothing better than the first bite into a huge tasty burger, as you work through the crusty bun, past the crunchy topping and deep into the glistening, moist meat. Add in the extra note from the fiery chillies and this becomes pretty much the best burger I've had in London. Which is pretty much what I was expecting, so it was just as well. From what I can gather, the variations on the theme served to my fellow diners were just as successful. We were particularly amused by the "low calorie" version which came with just as much gorgeous fatty meat but substituted the top half of the bun for a green salad. I'm guessing the brains behind Haché have decided that if you can convince the local Sloanes that swapping a bit of bread for dressed rocket counts as the healthy option, even if you sneak through just as much of the good stuff, you're on to a winner. In the same corner of the city that Tom Aitken has decided needs somewhere you can buy a mediocre fish and chips for £25, it warms the cockles of the heart to discover there are people willing to serve the best hamburger in London for a measly £6.50. As you can probably gather, I really loved Haché, with its straightforward hearty food, sparkling friendly service and bright and trendy dining room. And if you have any sense of what's good for you, you'll love it too. There's no way I could walk past a restaurant calling itself "Biguns" without wanting to know more. Under the eaves of a strange 60s red brick condominium on the corner of Warwick Way and Vauxhall Bridge Road, this strange place appears to be a throwback to the What's Cooking? style of UK/US eateries, back in the days when spare ribs and nachos were an outrageous novelty. 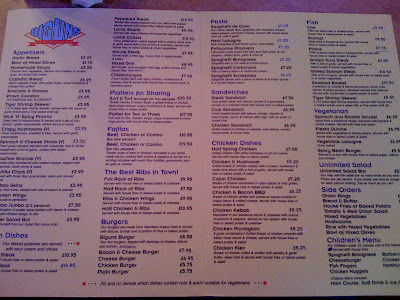 So accordingly, the menu travels a bizarre mid-atlantic route between fish and chips and cajun chicken, with peppered steak and "meat" lasagne thrown in for good measure. There's even an "unlimited" salad bar, where you can pick up a bowl of iceberg lettuce and e-coli bacteria from underneath a heat lamp. It is, of course, all pretty mediocre. 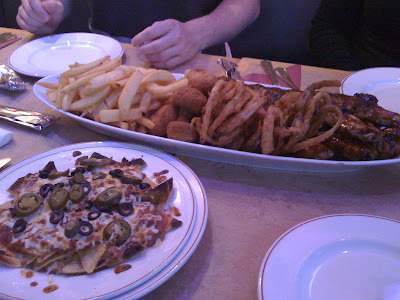 We went for the 'Platter for three' (between four of us), which consisted of tasteless ribs, wobbly chicken, soggy mushrooms in greasy breadcrumbs and oily onion rings. That's a whole lot of brown food. In addition we ordered a plate of Nachos, which were OK, and the platter also included a few skinny fries which I defy anywhere to mess up too badly. To be fair, it was all just about edible, and along with a couple of beers and a lemonade the bill came to about £7.50 each. There was plenty of food here - plenty of crap food, yes, but lots of it - and at this price you don't have a whole lot to complain about. As a US-style diner and grill, Biguns fails on almost every level. As a mid-80s themed restaurant specialising in retro gastro-kitsch, I'm sure it has a long and happy future. One of the few items that doesn't seem to have suffered from inflation is the "Tomato Essence with Crayfish", which is just as well as at £12.50 for a small bowl of unremarkable consommé with a couple of tiny bits of crayfish floating around in it, any more really would have been burglary. Bear in mind that this is crayfish, rampant vermin of our waterways and one of the cheapest crustaceans money can buy - I'm thinking particularly of that sandwich in Pret-a-Manger which comes stuffed with the blighters and costs about £2.50. If there had been a whole lobster tail floating in the bowl, £12.50 would have been about right. But for a dish whose raw ingredients must have cost literally pence (tomatoes, crayfish and basil, for heaven's sake) this was inexcusable. A companion's crab linguine (up from £8 to £9.50) was, to be fair, pretty good. Not £9.50 good, obviously, but just slightly less violatingly expensive than mine. My main course was a prettily cut pigeon in a nice thick red wine jus, and although was more cooked than it needed to be nevertheless tasted pleasingly gamey and had a nice crispy skin. 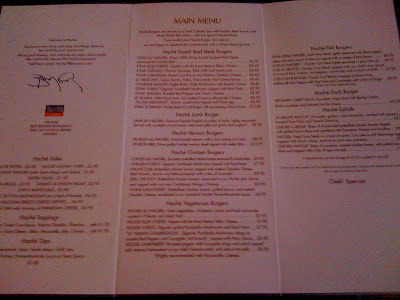 It was up from £19 to £23.50 - about the same price as my entire meal, including beer, cost at Dim T the other week. But because neither my bird or my companion's Dover Sole (£25 up from £21.50) came with any sides these were ordered as extra and along with a small pot of admittedly gorgeous house chips (up from £3 to £3.75) and a salad of more of those boring tomatoes and some sliced fennel (up from £3.50 to £4.75, a massive 36% increase) the bill mounted up. The raspberry trifle was a new addition to the pudding menu, thus saving it the comparison with the old prices. 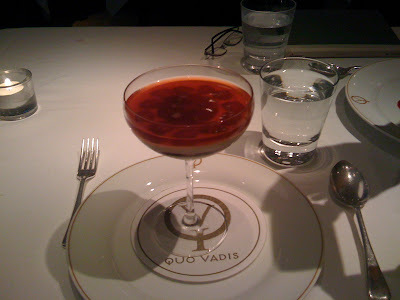 It was actually very nice, and prompted me to wonder why we don't see more jelly on modern restaurant menus. 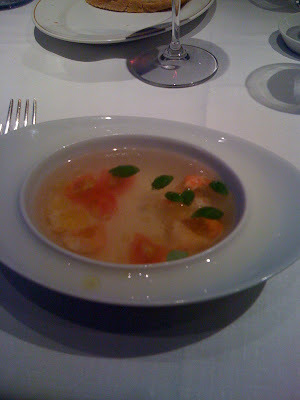 I might start a campaign to rehabilitate jelly as a dessert ingredient - it's sad that these days you are more likely to find jelly in your starter (I'm thinking particularly of Maze's "BLT" with tomato jelly) than where it belongs, with summer fruits and vanilla cream and accompanied by a chilled glass of Sauternes. And yes, a Summer Pudding was tasty enough as well, but at £7.50 (up from £6.50) it contained too few summer fruits inside its inch-thick bread walls to excuse the price point. The bill, including service, one and a half bottles of wine and that bloody cover charge, came to £98 each. That's about what I would reasonably expect to be charged for some of the best restaurants in the city (last time I visited The Square, for example, the bill came to about £89 a head), and this food, although perfectly pleasant, in no way justified those prices. 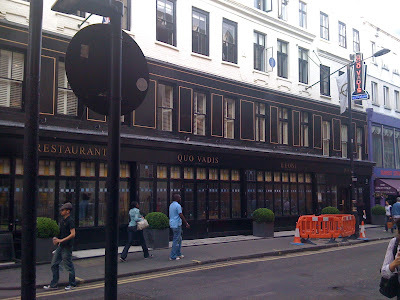 Quo Vadis would be a standard mid-range restaurant and I would have no problem in recommending it if the bill had been about half as much. As it stands, inflated to the point of cynicism, I can only suggest you stay away until someone comes to their senses and realises that charging £12.50 for a bowl of tomato soup does not win you friends. According to Giles Coren, Times restaurant critic and scourge of sub-editors the world over, "the application of superlatives to food is a terrible, terrible mistake". I suppose you can see where he's coming from - declaring anything to be the best, whether it's a burger or a restaurant or just some gin and vermouth in a glass, is pretty unhelpful and I can't help getting the feeling that most of the time these grandiose statements are deliberately made one week only to be ripped down the next. It does make good copy, after all. But where I can appreciate that an over-enthusiastic restaurateur may declare his spag bol to be "the best in London" to drum up some interest and get bums on seats, even if said spag bol turns out in the end to be awful, it's the use of superlatives in other weirder areas that I take issue with. Take, for example, Bank in Westminster, which proudly declares itself to have "the longest bar in Europe". Why should we care, exactly? Does the length of bar have some correlation with the skill of the bartenders or the freshness of the mint? Of course not - it basically just serves as some pointless extra trivia to stick on the website, as if punters are going to be racing up and down the length of the room, warm martinis in their hands, crying "Well the drinks are crap, but look at all this space!". Fortunately there is another reason to visit Bank other than to gaze in awe upon the length of the bar - it actually hosts a rather nice restaurant towards the back. 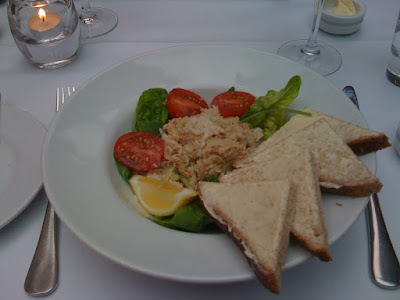 A starter of "Fresh Whitby crab salad" was not actually the freshest I've ever tasted, as both the crab and the bread could have been in better condition, but was redeemed by a generous lump of crab meat and a nicely seasoned salad. 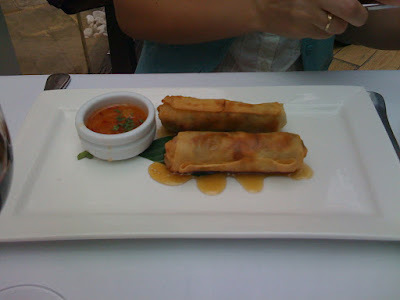 A companion's duck spring rolls were somewhat less successful, greasy and leaden with sub-par duck meat and standard bought-in sweet chilli sauce. Mains were a world away in terms of quality. 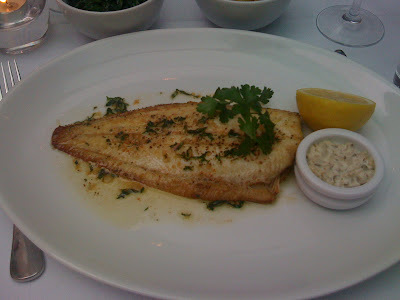 My Whole Brixham Dover Sole was gorgeous - rich and meaty and cooked to crispy-edged, buttery perfection. Not quite as breathtaking as the one I had at Scott's, but half the price and only slightly smaller so not much to complain about really. The only downside was again the bought-in tartare - if you're going to serve a whole Dover Sole and cook it so well, why not spend a bit of extra time making a nice homemade tartare to go with it? Lamb chops with summer vegetables also disappeared quickly and were served with good fresh veg, although there was perhaps slightly too much fat and gristle on the chops to justify the £19 price ticket. 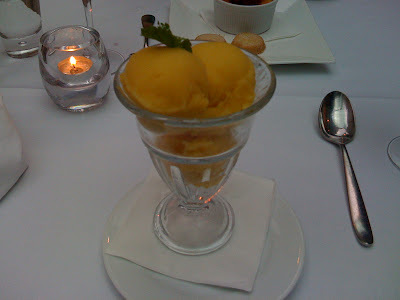 My passion fruit sorbet was just that - uninspiring but edible and fresh-tasting. 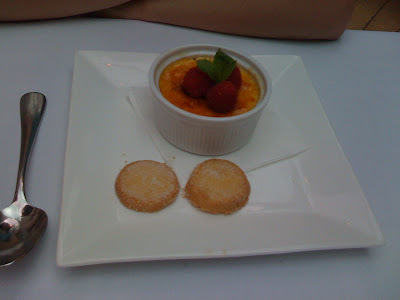 However the Crème brûlée was a really good dish, generously speckled with real vanilla seeds and topped with a still-warm crunchy sugar crust. It's very hard to give an objective appraisal of restaurants in this part of town as there are so few that are any good, but while not stunning in any particular respect, Bank nevertheless provides decent grub at only slightly inflated prices, and for that the civil servants and office workers of Victoria should be grateful. 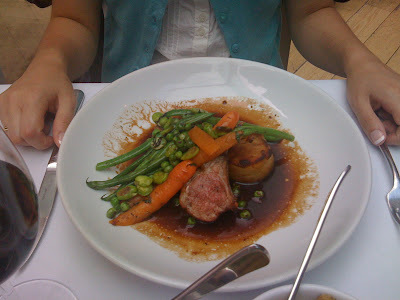 In fact, I'd go so far to say that it was the "best" mid-range hotel restaurant in the Buckingham Gate Road area. And they have my permission to add that to the website.